Influenza is a viral infection of mammals and birds caused by RNA viruses known as the influenza viruses. The infection attacks the respiratory system, i.e., the lungs, nose, and throat. Influenza is commonly known as the flu. It is different from stomach flu that causes vomiting and diarrhea. 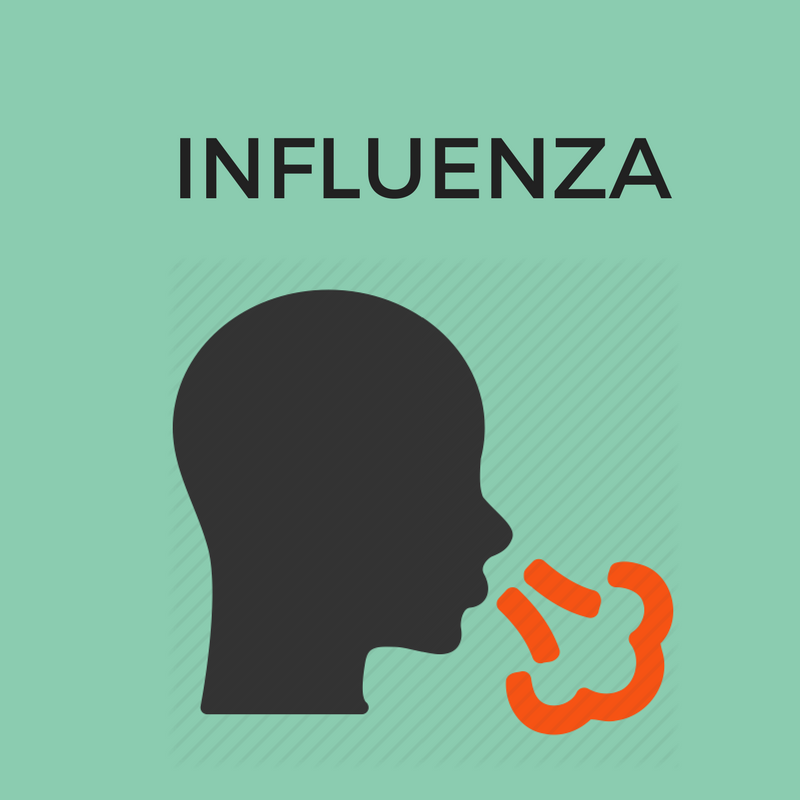 Influenza is also confused with the common cold, but it is more severe in nature. According to the US CDC, around 23,000 to 30,000 people die of influenza in the United States [Walsh]. At first, the symptoms of influenza are similar to that of the common cold. The patient may have a sore throat and runny nose. The difference between the symptoms of the common cold and influenza is that the flu arrives suddenly while common cold builds up gradually. Common symptoms of influenza include aching limbs and back, headache, chills, fever (more than 100 °F or 38 °C), nasal congestion, and fatigue and weakness [Mayoclinic.org a]. On the other hand, around 33 percent influenza patients are asymptotic [Carrat, et al]. Influenza is caused by flu viruses that spread through various mediums. They can travel through the air when someone carrying the infection sneezes, talks, or coughs. People can also get infected by touching objects touched by an infected person [Mayoclinic.org b]. The disease can be prevented either by vaccination or infection control. The vaccination for influenza is called The Influenza Vaccine. High risk groups such as children, elderly people, and chronic disease patients are highly advised to be administered the Influenza Vaccine. However, the vaccine is only moderately effective in healthy adults. Since the virus of influenza has a high mutation rate, the vaccine doesn’t provide protection for more than a few years. The World Health Organization (WHO) predicts the strains of viruses that are expected to circulate in the next year so that pharmaceutical companies can manufacture relevant vaccines. Influenza can also be prevented by taking good care of one’s personal hygiene. 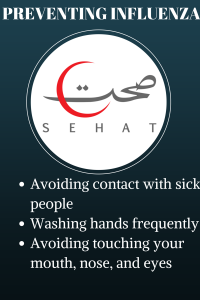 Avoiding contact with sick people, washing hands frequently and avoiding touching your mouth, nose, and eyes can help in prevention of influenza [Cdc.gov] . Factors that make you more vulnerable to the disease include age, occupation, location, chronic illness, weak immunity, and pregnancy. Age: Seasonal Influenza is more likely to attack children and people older than 65 years. There are other forms of Influenza that target different age groups. For example, the pandemic H1N1 virus targeted teenagers the most. Occupation: Healthcare workers are more likely to be affected by the virus as they deal with patients directly and are more prone to exposure. Location: People living with a lot of other residents have a greater chance of catching the disease. Chronic illness: People who are suffering from chronic diseases like cardiac issues or asthma have a greater risk of getting infected with influenza. Weak Immunity: A weakened immune system can make the victim fall prey of influenza virus more easily. The immune system can get weakened due to numerous reasons including cancer, HIV/AIDS, and anti-rejection drugs. Pregnancy: Pregnant women have an increased risk of catching influenza, especially in second and third trimester of their pregnancy. These anti-virals benefit the patients who are otherwise healthy. In the patients who had flu, these medicines decreased the length of the symptoms, but did not affect the complications of like pneumonia. However, a systematic review of published literature has found that benefits vs. harms remained unclear, and advised caution in use (The NNT). In conclusion, influenza is caused by the influenza virus and it spreads through direct body contact with an infected person and transferring of germs through other media such as touching the same objects and breathing in the same air as the infected person. It can be prevented through vaccines and infection control. The treatment includes adequate rest, drinking fluids, and anti-viral drugs. Carrat, F. et al. ‘Time Lines Of Infection and Disease in Human Influenza: A Review of Volunteer Challenge Studies’. American Journal of Epidemiology 167.7 (2008): 775-785. Access Date. 18 Oct. 2014. Cdc.gov. ‘CDC H1N1 Flu | H1N1 Flu And You’. N.p., 2014. Access link. 18 Oct. 2014. Mayoclinic.org a. ‘Influenza (Flu) Symptoms – Diseases And Conditions – Mayo Clinic’. N.p., 2014. Access Date. 18 Oct. 2014. Mayoclinic.org b. ‘Influenza (Flu) Causes – Diseases And Conditions – Mayo Clinic’. N.p., 2014. Access Date. 18 Oct. 2014. Walsh, Lauren. ‘Influenza Already In Three States, Including Alabama’. Abc3340.com. N.p., 2014.< Web link http://www.abc3340.com/story/26808463/influenza-already-in-three-states-including-alabama> Access Date. 18 Oct. 2014. Who.int. ‘WHO | Recommendations for Influenza Vaccine Composition’. N.p., 2014. Access Date. 18 Oct. 2014.